Amsterdam got its name from the Amstel River. 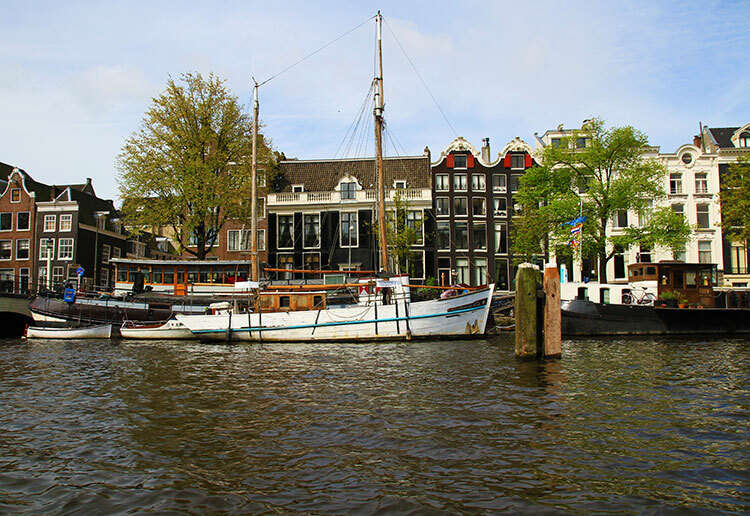 As we set out from the Intercontinental Amstel Amsterdam, which is one of the oldest buildings in Amsterdam and located on the Amstel River, the captain explained that Amsterdam was originally founded in the 12th century as a fishing village. The village derived its name from the Amstel River and the dam that was built in 1220 to avoid the floods from the ZuiderZee (South Sea) entering the inlands. Over time Amstellodamus evolved into Amsterdam. 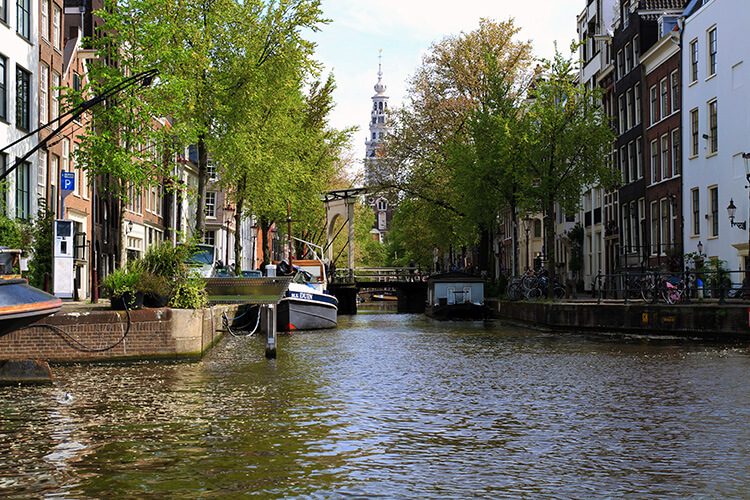 There are 165 Amsterdam canals that combine for a length of over 100 kilometers (about 60 miles). The Canal Ring became part of the UNESCO World Heritage list in 2010. Monet painted the South Church during a visit to The Netherlands. The Zuiderkerk, or South Church, was the first church built in the city for Protestant services and was built between 1603 and 1611. French impressionist Claude Monet painted the church 13 times during his visit to the Netherlands and the captain stopped for us to admire the exact angle as the Monet painting with the Groenburgwal canal leading up to it. The tilted houses are called Dancing Houses. The houses were built for the wealthy bankers and merchants and did double-duty as both houses and work spaces. The soil was so swampy that they had to built on stilts and that caused them to wobble and sink into the river, so now they are each a little off kilter! Amsterdam has more bridges than Venice. It’s almost hard for us to believe as we’ve trekked over Venice’s bridges countless times during our time living outside the Italian city, and it sure feels like there are thousands. There are only in fact 409 bridges connecting Venice’s canals. Amsterdam actually has 1281 bridges. That’s three times as many as Venice! Magere Brug is the most famous bridge. Of the 1281 bridges in Amsterdam, the Magere Brug (also known as the Skinny Bridge) is the most famous. 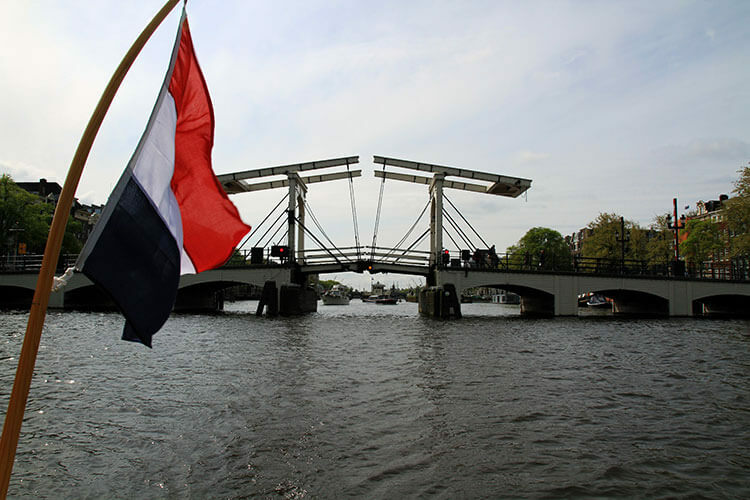 Approximately every 20 minutes, the Dutch draw bridge opens to let boats pass through. There are 2500 houseboats in Amsterdam. 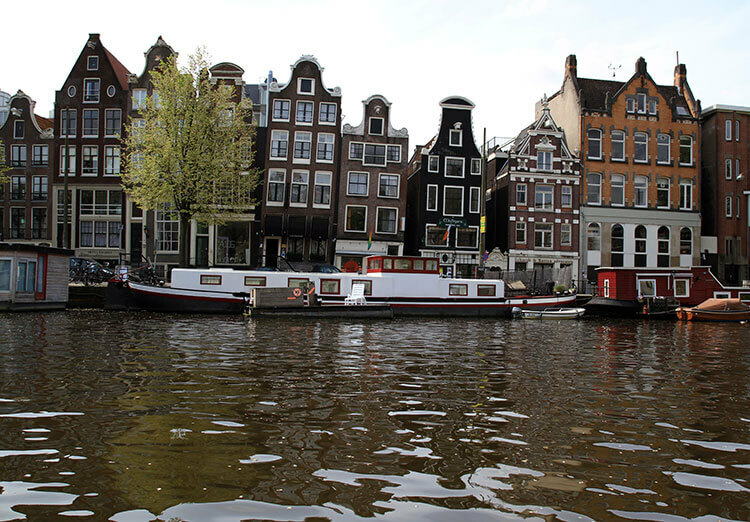 2500 houseboats line Amsterdam canals and many have been afloat for more than a century. There are different types of houseboats and the concrete kind are the most desirable as they don’t need to be taken to the shipyard for repairs. 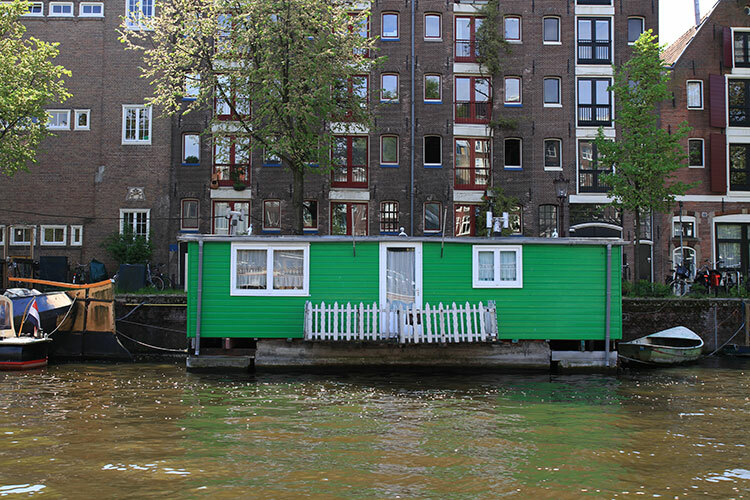 Amsterdam has laws about the houseboats and the wooden ones need to be repainted every three years. Most are residential, but visitors can find houseboat hotels, rentals and even a Houseboat Museum if you just want to see what it’s like on one. Amsterdam was once surrounded by defensive walls. 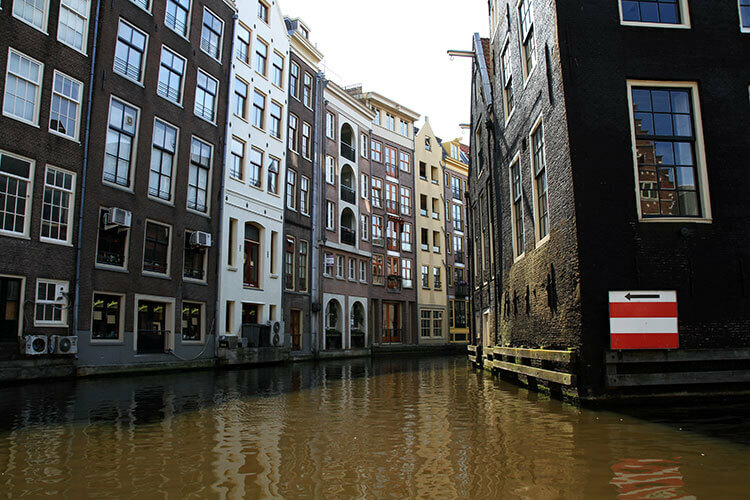 Built in the Middle Ages, the walls of Amsterdam were meant to defend the city against an attack. The walls were torn down in the 19th century, but remains can be seen when cruising the canals. 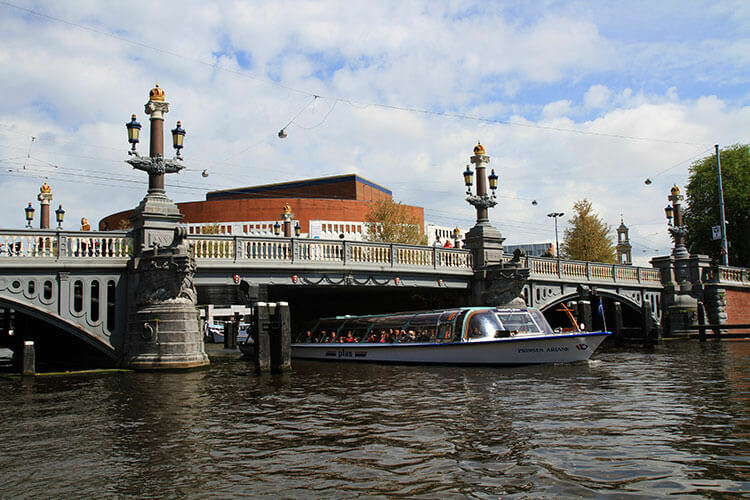 The Intercontinental Amstel Amsterdam offers canal cruises on their authentic salon boat at 10:30am on Saturdays and Sundays for €35 per person. Book with the concierge. You can also book at canal sightseeing cruise that departs every 20 minutes daily or specialty canal cruises like a pizza canal cruise or romantic dinner canal cruise with various companies. Prices range from $20 – $100 per person. This article contains affiliate links. When you book on Booking.com or GetYourGuide through our affiliate sites, we earn a small commission at no additional cost to you. 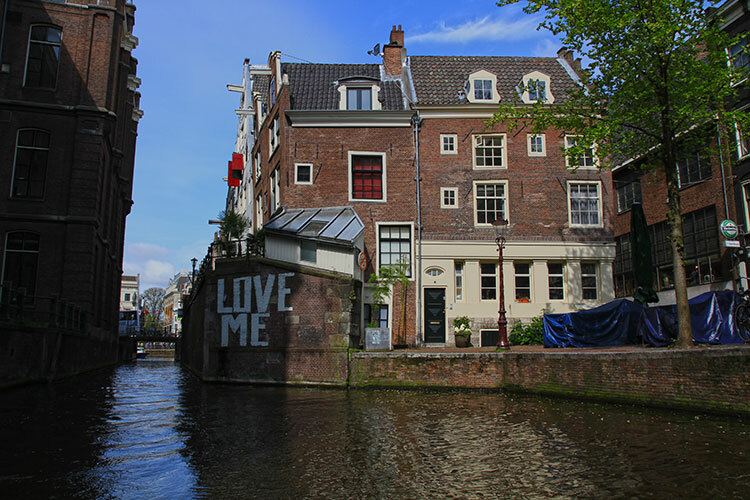 Very interesting – can’t believe we still haven’t done a canal cruise even though we’ve been to Amsterdam a dozen times! Sadly, the canal cruise is the only thing I did in Amsterdam. I spent the rest of my time there sick in bed. Wow, I didn’t realize how extensive Amsterdam’s canal system was.. That’s also interesting how the houseboats are required to have a fresh paint job every few years. Did you check out the houseboat museum at all or now? I didn’t get to check out the houseboat museum, though really wanted to. It’s just around the corner from Anne Frank House. Unfortunately I came down with the flu while in Amsterdam and spent the majority of my time sick in bed. Ah well, next time! Those are some really cool facts about Amsterdam! I especially can’t believe it has three times the number of bridges as Venice! From the brief few hours I spent there a couple of years ago, I don’t remember it being ‘that’ bridgey! It sure feels like there are thousands of bridges in Venice. I couldn’t believe there are three times as many in Amsterdam. Actually, I didn’t realize Holland has as much water as it does. Guess I really didn’t know much about the country before I went. The cruise I did was so fantastic because the captain was incredibly knowledgeable. As I passed by the canal cruise boats, I was happy I wasn’t packed in like a sardine and I would bet the audio recording didn’t give nearly as much information as I got. We didn’t do a canal cruise while we were there since it was cold and rainy almost the entire 5 days. Maybe next time! The weather was terrible for most of my trip in Holland! Luckily I had one morning that the weather was perfect for a canal cruise. Oh how cool! That must be a great photo because the dancing houses are definitely picturesque! Amsterdam is a good and nice city, but I like Belgian Bruges more; it is more cozy. Bruges is indeed much smaller and has a cozy feel in comparison to Amsterdam. We enjoyed both cities since they each have something different to offer. I can’t believe Amsterdam has more bridges than Venice! I didn’t know that… Love the back stories, thanks so much for sharing them and the pictures! Did you know that the famous painter Van Gogh had 1.5 ears, 0.5 was cut off and given to a prostitute? Not so I believe: Van Gogh cut off the whole of one ear and gave it to a cleaning maid at a brothel (not a prostitute). The maid had been savaged by a rabid dog and left scarred, it is thought that Van Gogh felt badly for her and acted how he thought may help her, in his mind. This was so informational! I’m doing a school project on Amsterdam, and this helped so much with my essay!